Curiously, and somewhat admirably, Paul Weller is one of the very few artists of his generation that actually makes one less bothered about what he did at the start of his career than what he does now. It’s 40 years since he first broke through with The Jam and In The City hit the record shelves, but unlike so many of his contemporaries who are only too happy to hit the anniversary trail with a tedious regularity (just wait for those 50th anniversary shows where one surviving member is propped up by youthful sidemen and a Zimmer frame), Weller has little truck with the past. As evidenced by the creative re-birth that started with 22 Dreams just under a decade ago, Woking’s most famous son has got on with the business of the here and now with one eye on the ticking clock and an ear open for new sounds. Following on from the experimental nature of his previous three albums – works that rank among his very best material - A Kind Revolution initially presents itself at odds with its predecessors, yet repeated listens find a document that continues in a sequence of high quality control. So while the production isn’t as in-your-face as before, the flourishes that characterised those releases are here deployed to subtle effect on an album that’s only too happy to explore a variety of stylistic routes including blues, jazz, deep house and dub elements to make a surprisingly coherent and cohesive statement. The opening one-two of ‘Woo Sé Mama’ and ‘Nova’ really do lull the listener into a false sense of security. Both up-tempo numbers rooted in soul and psychedelia – the latter makes nods to the Pink Floyd of swinging London – the playing and delivery is made by an artist and band clearly enjoying themselves but it’s what follows that truly grabs the attention. The real core of the album is based around Weller taking a look at the world as he approaches his 60s and trying to make some sense of the turmoil, madness and instability that’s come to define the second decade of the 21st century. Crucially, these aren’t howls of rage but something more contemplative and meditative and, consequently, more memorable and affecting. Featuring Boy George on backing vocals, ‘One Tear’ evolves from a hybrid of influences including dub, house and funk into a deep groove that finds Weller raging against organized religion and the carnage that’s been wreaked in the name of God. Equally affecting is ‘The Cranes Are Back’ wherein Weller tries to find hope in a desolate world that’s becoming increasingly desensitised to images of dead refugee children washed up on beaches. His optimism is palpable in the shape of cranes – both the birds and machines – that represent re-birth and regeneration. Not that he pretends to have any answers. ‘The Impossible Idea’ is a yearning for a better world but how we get there is anybody’s guess. And that’s not a cop out, but an admission of a world in chaos led by people with even less of a clue than those they’re supposed to be representing. 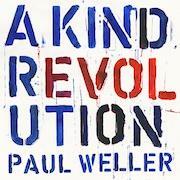 But what’s also remarkable about A Kind Revolution is Weller’s heightened sense of melodicism that translates as hope and so prevents the album falling into despair. Indeed, as displayed by ‘Hopper’, a track that wouldn’t feel out of place on a Super Furry Animals’ set list, sometimes all you can do is take some time out, kick back and watch the world go by. Paul Weller may well be hampered by a particular image in the eyes of his detractors as much as his more conservative followers, but peel away the surface layers and you’re left with a restless artist with an itch that just needs constant scratching. And let’s hope it stays that way; with the past firmly behind him, Weller’s forward advance is something worth looking forward to whilst savouring a satisfying present.